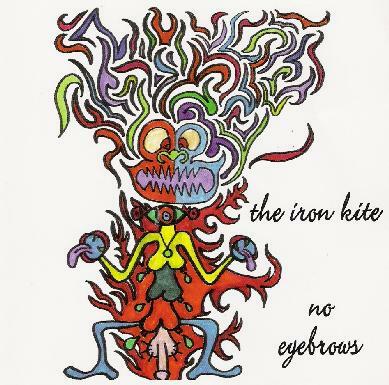 The Iron Kite - "No Eyebrows"
The CD is a live recording from the bands Beerland gig in Austin, Texas, September 2004 and is also the bands debut CD. Yes, but what's it like? Well! If mayhem and percussion is what ya dig dude, then ya'll dig these dudes. If ya want anything else but random noise jams, ya best look elsewhere, because ya'll get nothing else but this. Think of the noise quote in an early Pink Floyd vein, or Amon Düül II even, because even though it is "noise" for the majority of this 45 minute live set, I can somehow get away with it, in a curious way, due to this resemblance. It is, thankfully, totally instrumental, apart from the odd chant/screaming/vocal unrest, and this to me is a sort of plus. But when I think of it you couldn't sing anything else over it anyway. It is improvisation using things that you bang and crash, and to be honest there's only so much that ya can take of it. It sometimes sounds like a broken record, but then again it does motion along, there is tempo change to a certain extent, and it is very Amon Düül II. So I cannot really criticize it because I love Amon Düül II. I mentioneded Pink Floyd at the beginning, but Amon Düül II is more appropriate as a likeness. I love things that last longer than a 5 minute pop song and find that 45 mins is around my mark for concentration. And boy do you need it for these noisy B******! I would not advise taking your Grandmother along to one of their gigs, that's for sure. Because, as in that famous English Pink Floyd TV interview, the interviewer was brought with the string quartet and found it all a trifle too loud, in so many words. You have been warned. It is experimental noise for 45 minutes non-stop. It is hard on the ear at times, but obviously not as hard on the ear as Willie 'F******' Nelson, and that my friend is a huge compliment. I know that some will find it a trifle too loud, and frankly a bit dull. When will they play some music? They may ask? But I like it. As another heed, it is only for those who like weird experimental improvisation. I think that you know who you are, and what that means. For more information you can email: brironkite@hotmail.com.